St. Patrick's Day Punch Saves A Wedding Reception. St. Patrick’s Day Punch Saves A Wedding Reception! This recipe has been around for years and has always been a good “go to” recipe for wedding receptions, bridal and baby showers, Valentine’s Day, Christmas or just for fun or St. Patrick’s Day. The first time I made it, was in 1968 as a last minute addition for a wedding reception that was being held where the two ladies in charge of the reception… thought the other had picked up the yellow punch that had been ordered. The point is they panicked and I happen to be in the right place to hear their plight. I offered to run to the grocery store 1 block away and pick up the necessary ingredients to make this easy punch. Luckily the colors being used at the reception were pale yellow and pale green…but when I got to the small market, I couldn’t find Lemon Sherbet, (which was my first choice), so I settled for Lime Sherbet. I grabbed several liters of the lemon lime soda, vanilla ice cream and the sherbet…..and everyone loved the punch. Many years ago, I learned the hard way to add the lemon lime soda to the punch bowl first or there was too much froth or foam. The wedding reception was none the wiser. How about a little more background and another true story? This concerns the Mason Ball Jars that you see in the pic of Lime Sherbet Punch! About 15 years ago, a friend visited my home and commented on the red carnation silk flowers…. 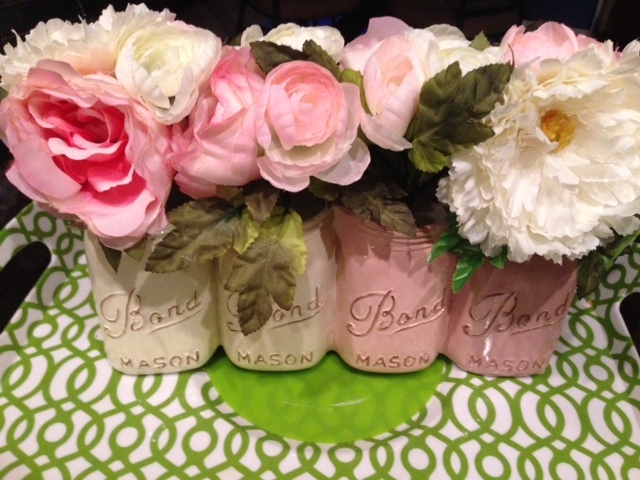 displayed prettily in a Mason Ball Jar and sitting on one of my tables in my living room! 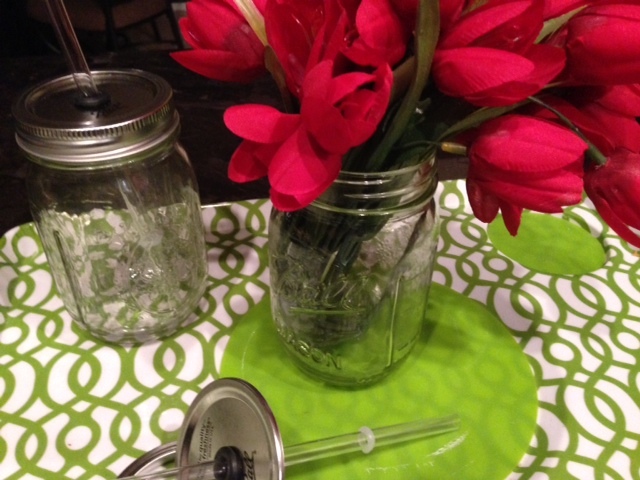 I didn’t have the heart to tell her it was a deliberate choice…I just thanked her and took the flowers out of the Mason Ball jar and put them in the vase she gave me. She passed away several years ago, but I will never forget her thoughtfulness to help me display my flowers. 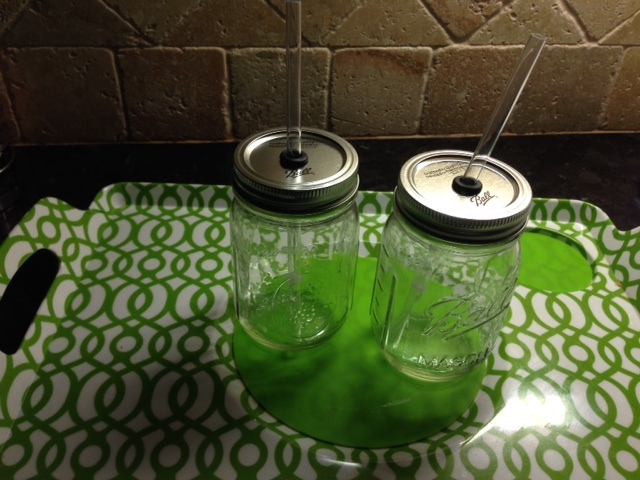 I found these cute Mason Ball jars with straws at an old fashioned hardware store! I liked the way the lid held the straw in place for drinking. I fell in love with the jars because they reminded me of my canning jars and thought I would find a use for them very soon…..and here it is St. Patrick’s Day and I have a wonderful idea. 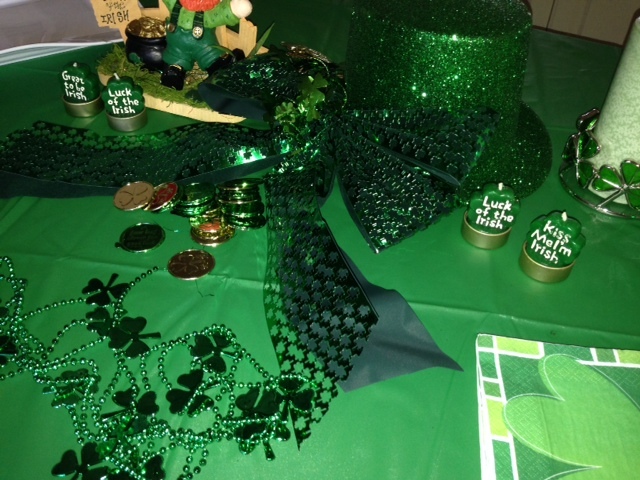 I think it makes a pretty display for the wearin’ O’ the green! Below is the printable punch recipe for your files if you don’t have it already. If you want to “spice” the punch, (notice I didn’t say spike, same concept, just different words) 🙂 …..you can add some lime vodka…or champagne ! Top ‘O the Mornin’ to ye….….tis a beautiful day today and if keeping with the Irish… May the wind be always at your back! 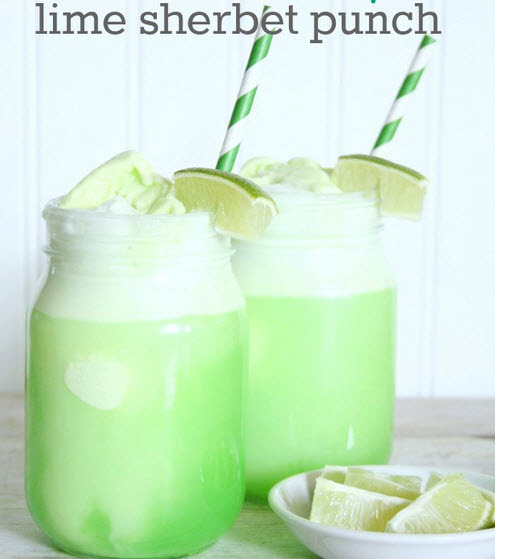 A refreshing Lemon Lime drink that is perfect for any occasion but this one is for St. Patrick's Day! Pour the lemon lime soda into the bottom of a punch bowl. Stir gently as mixture will "foam"! The longer the punch sits, the more the foam will dissipate . You can float lime slices in a punch bowl if desired. You can add 20 ounces of pineapple juice for a kick...or you can add a small can of frozen concentrate of lime juice. If you want a soft pink for a baby shower for example: Use the following. You get the idea of creating different colors for different occasions. 🙂 Just keep tasting until you get the flavor that suits you. « Rock Chalk Jayhawk…KU….The Little Team That Could! I am a mason jar junkie! I love what you did with them!! As I said I have canned just about everything in them but using them in decor is cool too. Thanks for stopping by.